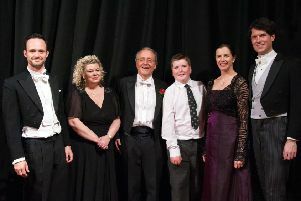 Conductor Robert Hammersley and his galaxy of 160 singers and instrumentalists – the Ardingly Choral Society, Mid Sussex Sinfonia and Copthorne Prep School Choir – met the challenge convincingly. The first star was the school choir, under Sandra Janman’s encouraging direction. They delivered fourfold delights, ending with ‘Tipperary’ and ‘Pack Up Your Troubles’ sung together. A second star shone as the Sinfonia, led ably by Martin Palmer, conveyed understated optimism in the ‘Intermezzo’ and, blending seamlessly with the Choral Society, life’s victory over death and suffering in the ‘Regina coeli’ of Mascagni’s ‘Cavalleria Rusticana’. Before the interval two more suns burned brightly. Hammersley’s arrangement of ‘Abide With Me’ – men and celli, ladies with full strings and harp, duet with full orchestra – outshone even his ‘Remembrance’, when the audience had stood. Next, the evening’s theme of bright futures won by sacrificial self-giving was summed up in Handel’s Coronation Anthem ‘Let Thy Hand be strengthened’. Parry’s ‘Jerusalem’, with stirring audience participation, led into Johnny Dunsford’s striking account of the Royal British Legion’s life-changing resettlement support, to which the concert was dedicated. The second half brought Fauré’s sparkling, consolatory ‘Requiem’, written only ‘for pleasure, if I may call it that!’ Its ‘Libera me’, composed years before his parents died, is the nearest it gets to dread and judgment. The stars twinkling here, as before with The Sixteen, were Sussex-based Charlotte Mobbs (soprano) and her husband Eamonn Dougan (baritone). Charlotte’s confident ‘Pie Jesu’ and Eamonn’s earnest ‘Hostias’ and ‘Libera me’, strongly underpinned by well flowing choral and orchestral forces, soared to memorable crescendi before the choir sang us gently towards a paradise beyond the stars.